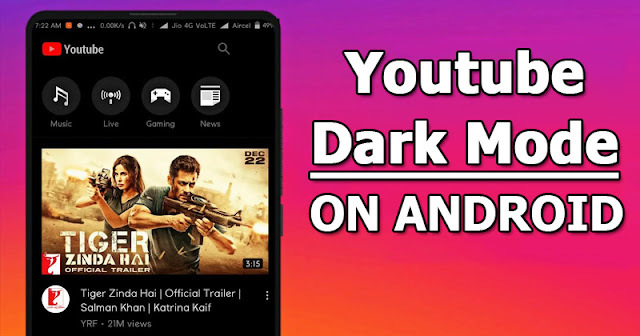 How To Enable YouTube Dark Mode on Android Right Now. We all use Youtube, it was undoubtedly one of the most popular video streaming site out there. Right now there are billions of users who spend time on Youtube to watch the latest music, videos and much more. We can’t ignore that fact that we spend countless hours watching videos on YouTube. YouTube now has apps for Android and iOS which already carries a niche interface. However, staring at bright screens, especially at night, can be a pain for eyes. Recently, we have heard the news that Google announced a new “Dark Mode” for iOS devices. So, iPhone users can enjoy this new feature by going to the settings panel. However, a Dark mode is still “Coming Soon” to Android and we’re not exactly sure how long it will take. The method actually requires modifying the a value in the shared -prefs in /data. That’s why root access is mandatory. If you need some information regarding how to root your Android smartphone, then this guide might help you. Step 1. Download and Install Preferences Manager from Google Play Store on your rooted Android device. Step 2. Now open the app and find YouTube app in the list. After finding the YouTube app, you need to open the YouTube.xml file and then search for dark. Step 4. Save and then force close the Youtube application. That’s it, you are done! Now whenever you will open the Youtube app on Android, you will get to see the Dark Mode interface. The app will carry a nice dark gray background and white-on-black icons. For more information regarding the tutorial, visit XDA-Developers. So, what do you think about this? Share your views in the comment box below.